Usually the hard part of a project like this is finding the water. For us that was easy. I have been on this farm for 10 years and have never seen this spot dry. 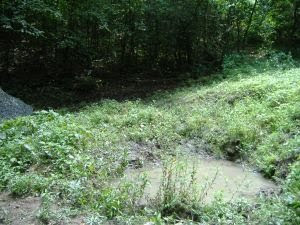 We just dug down until we found a small trickle of water coming out of the ground. We then placed the collector in the bottom of the hole we had dug. The small pipe on the left goes directly to the spot we found the trickle of water. 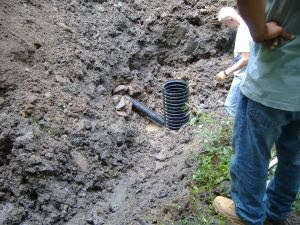 We came out of the right side with 3” PVC out to the water tank. 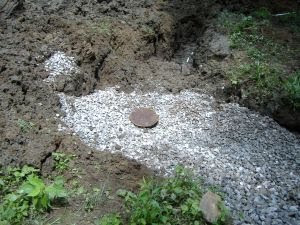 We filled in around all that with 14 tons of 2” gravel and placed a steel cap over our collector. We took the dirt removed from the hole and piled it around the uphill side of the spring to prevent surface water from getting into our spring. This ensures that only ground water makes it to the tank. After that it was just a matter of running the pipe down the hill to our existing plumbing. Thanks to my good friend Dale for sending this to the site.